When I was in college I had the opportunity to hear Douglas Adams, the author of the Hitchhiker’s Guide to the Galaxy, give a lecture on, of all things, environmentalism. At the end of the lecture there was a Q and A period with the audience. “Why a towel?” was asked by a burly gentleman with thick glasses and a fluffy towel tossed casually over his shoulder. Mr. Adams answered, his wife believed there were two types of people in this world, those who always know where their towel is and those who don’t. He is in the latter group. I am firmly in the first group. Waponi Woo had a towel problem. My extensive collection of luxurious, terry cloth towels followed me from our house on land to our home on the water. In Washington, attached to a dock with cheap power and dehumidifier, they served us well. In Mexico, where we make our own power and water, they proved to be a little unwieldy. It was with heavy heart I admitted a change was needed. Ryan’s college roommate, Ben, visited us in February and brought with him a microfiber thing he called a towel. Ryan thought this was the way to go. I told him I no, I don’t want to dry myself off with plastic; it is a textural thing, microfiber I am sure works great, I just don’t want to use it for a towel. So, I started looking for alternatives and found a plethora of people using Turkish towels on boats. I decided this was the way to go and ordered some from a variety of vendors. 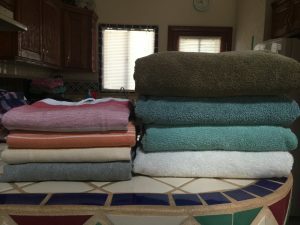 I received my towels at the end of April. I love my Turkish towels. They take up a lot less space. They are handy as a swim suit cover-up as well as a towel. 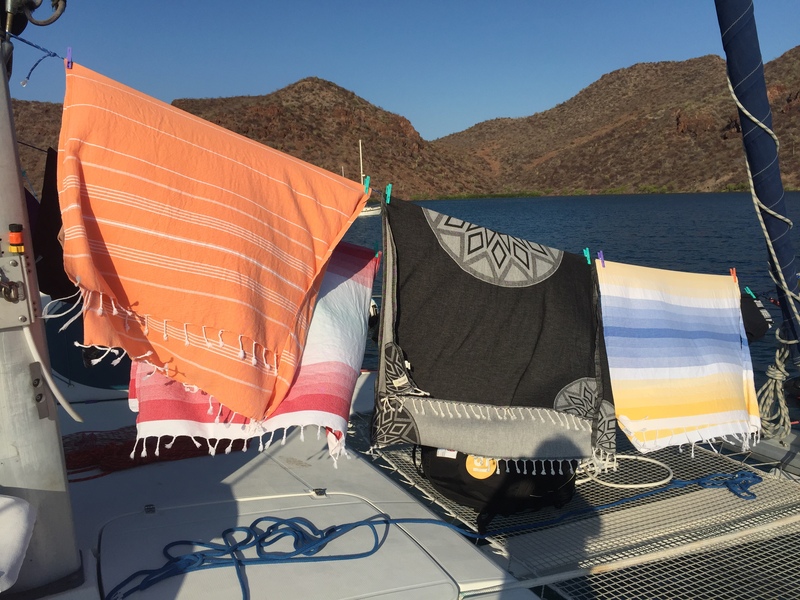 I would recommend going the Turkish towel route for travel, camping, RVing, and boating. Bersuse Ionia Turkish Towel: 100% Recommend… This is my towel. It is the thickest of the towels I tried. There are a variety of designs and colors to choose from. This was also the most expensive of the three. The Riveria Towel Company, Santa Barbara Collection: 100% Recommend… We have two of these; one in yellow/blue and one in red/mint. The red/mint one is India’s towel of choice. These are a little thinner and will need a wash before use. They were a little crunchy when they arrived but softened right up after a wash. The Riveria Towel Company, Essential Turkish Towel: 100% Recommend… These are a good basic towel. They come in a variety of colors and cost a little less than the previous two. The Riveria Towel Company, Cotton Diamond Print Turkish Towel: 50% Recommend… It is okay. This one has a really loose weave and long, stringy fringe which tends to catch on everything. It is the least expensive option and it seemed like this was a case of getting what I paid for. My new towels on laundry day in Puerto Escondido. A size comparison of my terry cloth towels next to the Turkish towels. …if you haven’t read, The Hitchhiker’s Guide to the Galaxy, you should. Now. I mean it. This entry was posted in daily life and tagged towels on August 11, 2017 by Caroline Spott. Your dad would hate these…….as usual I think they sound great!!!!! You are SO lucky to have had an encounter with Douglas Adams! I’m am really jealous. Can you say at this point how durable you think the Turkish towels might be? Fading? My towel in question was an MSR PackTowl. I recommend it if you have to carry the thing on your person everywhere, don’t want it to take up much space and can’t wait for it to dry itself off. Like if you’re riding your bike along the length of Baja California. I definitely wasn’t using it on the boat!